October 8th, 2015. 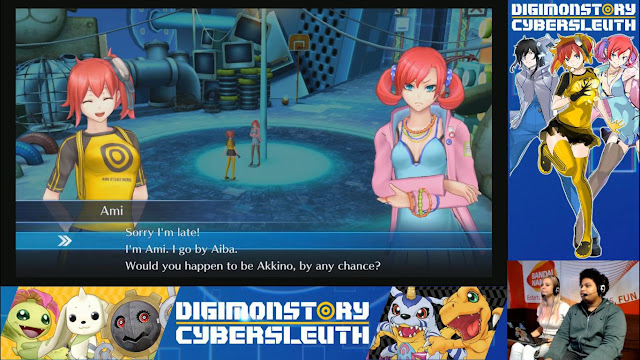 Several hours ago Bandai Namco EU streamed an early English-language build of Digimon Story Cyber Sleuth to Twitch, giving a first look at its translated script and confirming the previously announced cross-buy option between the PlayStation 4 and Vita editions of the game. The English script is drawing some concern however, as the Cyber Sleuth shown during the stream wavered between professionally-edited dialogue and translation that was spotty at best. In several of the game's cutscenes character's lines were improperly represented, with core cast member Shiramine Nokia's subtitles memorably reading "I'm late" rather than what her spoken Japanese indicated--"You're late." Bandai EU stated in a response to one comment that the game would not be "early" 2016 for Europe as has been said for North America, but confirmed a physical release of the game on PlayStation 4 in select European countries in addition to the established digital download option. Several errors in the script caught the attention of viewers. In particular, one of the main dungeons of the game Kuuron クーロン--translated in our Let's Play as "Cron" from the software utility--had no consistent name in the stream's script, which alternated between referring to Kuuron as "Coulomb" (from the unit of electrical charge) and "Kowloon." (Also used as the name for a location in Digimon Story Sunburst & Moonlight.) The area of Kuuron visited was also inconsistently referred to as either Junk Park (Garakuta Kouen) or Galacta Park, drawing from the same phonetics. (In-game Kuuron is spelled out in English as "Cool-wrong," to the derision of Cyber Sleuth's fanbase.) However, Bandai EU assured viewers that this was only an early version of the game. 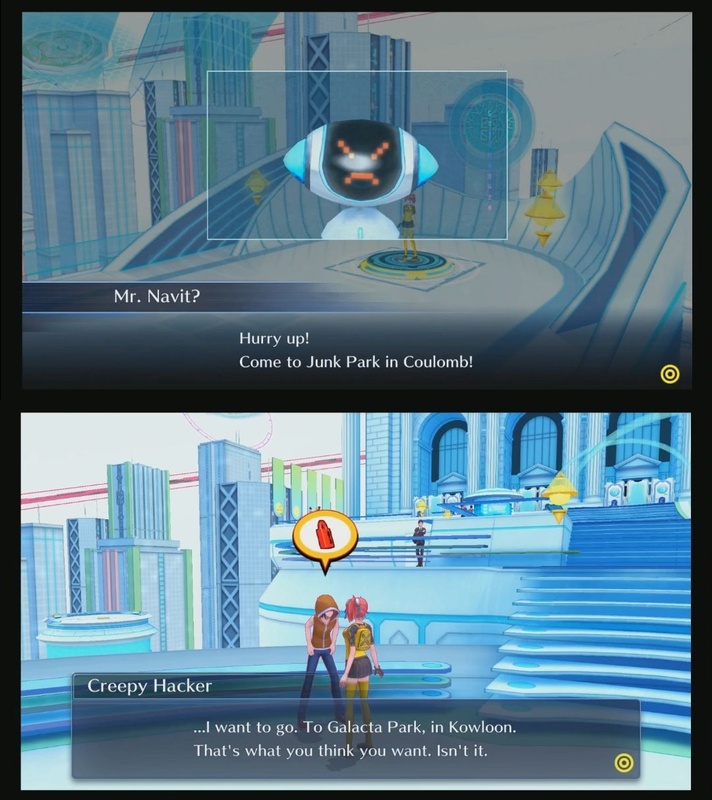 The stream's script most likely does not represent the finalized incarnation of Cyber Sleuth's English edition. 10/9/15 update: In response to questions regarding the script, Bandai EU has stated that the CS build streamed was not final, and is not representative of the game's commercial release. More than six hundred people tuned into the stream, at its peak bringing in 681 live viewers. Chat comments were focused on the game's lack of an English dub, which has proved particularly controversial with the American gamers tuning in. Some would call it entitlement rather than genuine criticism, a belief that Cyber Sleuth is somehow not good enough for gamers unless it has a dub. However, the decision to retain the original Japanese voiceover has found praise elsewhere, as Cyber Sleuth has several extremely talented actors on board, with special regard to Han Megumi's rapidfire mouth-running performance as Nokia. Finding an appropriate match for this show stealer in the English dub industry would be both incredibly difficult and expensive, as would matching voices to several other characters like Duftmon (Wakamoto Norio), and tracking down a diverse cast to voice the game's numerous Digimon. A recording of Bandai EU's stream can be viewed here. Digimon Story Cyber Sleuth will launch in English in early 2016 in North America, and 2016 in Europe. @ seriously: are you parodying the scripts "engrish", or are you just bad at grammar? Lol. I hope it's the former.